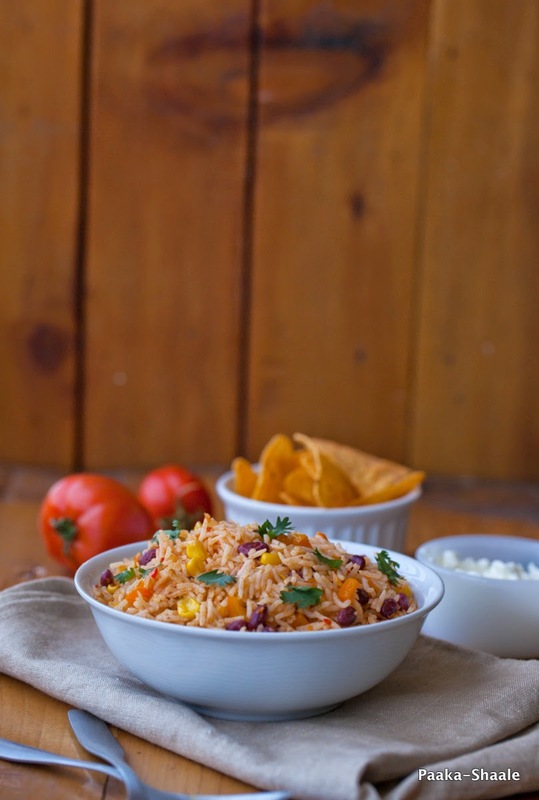 I think I have already confessed about my love for the Mexican cuisine and Salsa in this post. 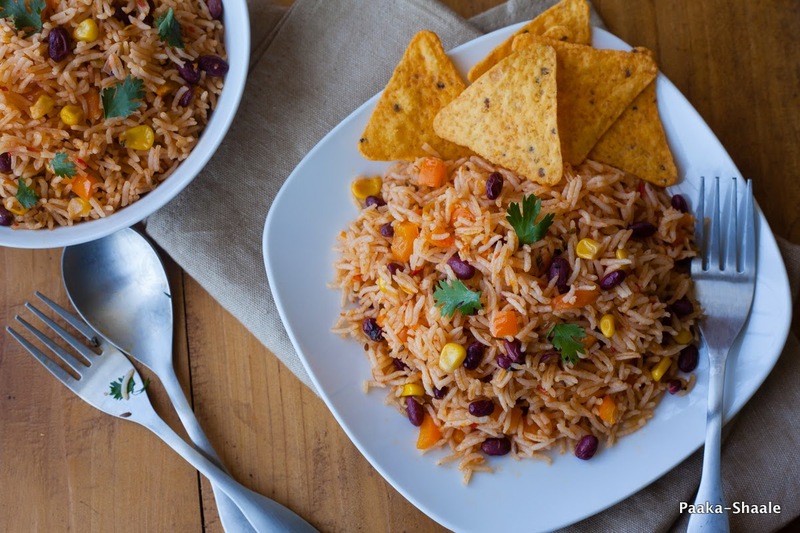 So in this post, I am actually taking this love one step further by making Mexican rice with salsa. I have another confession to make. I am a sucker for easy and quick fix recipes. I do enjoy making dishes which involves elaborate cooking techniques. But that is once in a while. 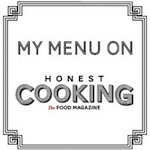 Most of the times, I prefer dishes that is quick to prepare and yet taste delicious and wholesome. Recipes like these come to my rescue when I don't have enough time to cook. Or, when I have to pack S's lunch box in 30min. I made this rice today for my lunch. And it was made without a thought. I had some leftover rice and some habanero salsa in the fridge. There was also some cooked Rajma in the freezer, so I decided to combine all of them to make this flavorful rice. I couldn't believe, a spontaneous preparation could taste this good. Even if I may say so myself. The best part about this recipe is, it can be customized to your taste and availability of the ingredients. 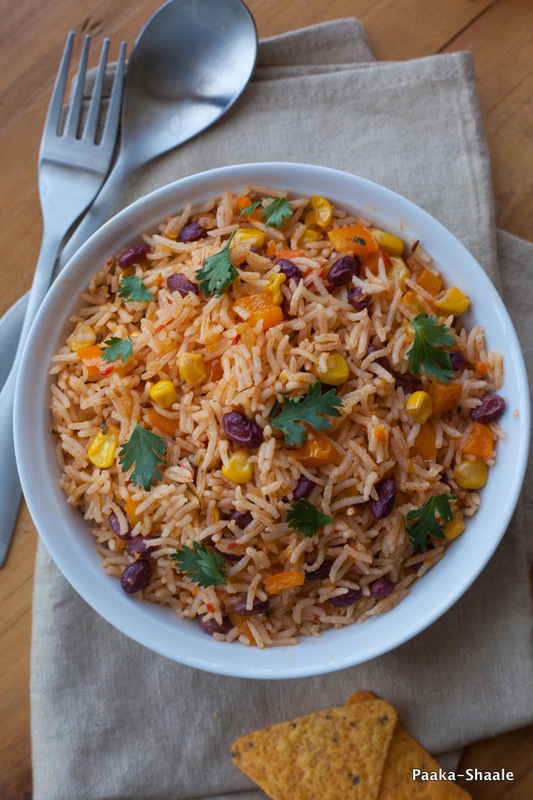 You can substitute the kidney beans and corn with vegetables with carrot and french beans. 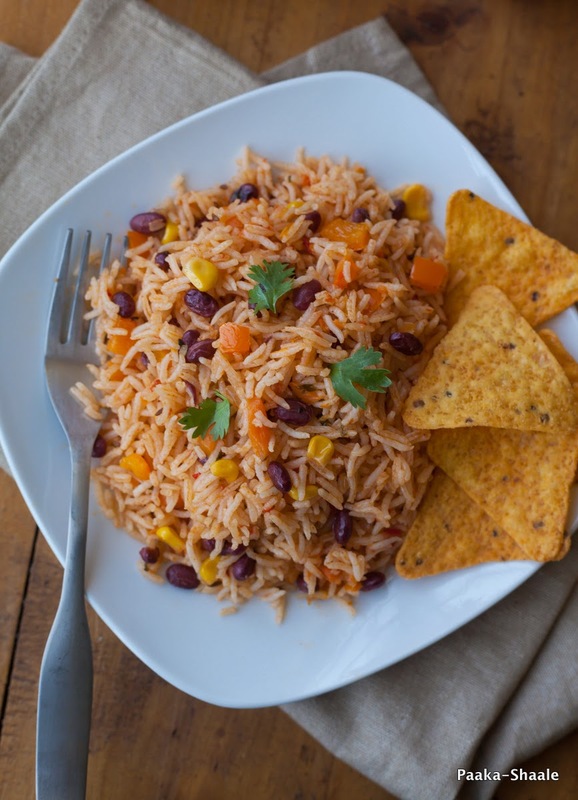 The basmati rice can be replaced with brown rice to make it more nutritious. 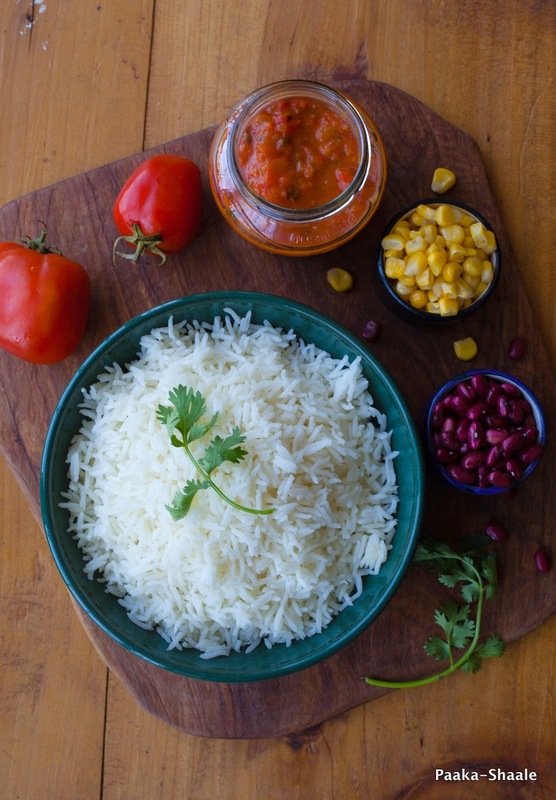 If you prefer you rice less spicy, then just substitute the habanero salsa with red salsa and you are good to go. Toss the cooked rice along with the melted butter and set aside. Heat oil in a wok and add the cumin seeds. Once they turn brown, add the chopped onions and fry till they turn pink. Add the frozen corn and the kidney beans and fry for 3-4mins. Stir in the chopped bell peppers and fry for 2-3mins more. Add the sugar and the salsa and mix well. Stir in the rice and toss well with the mixture. Garnish with coriander leaves and serve with tortilla chips and sour cream on the side. 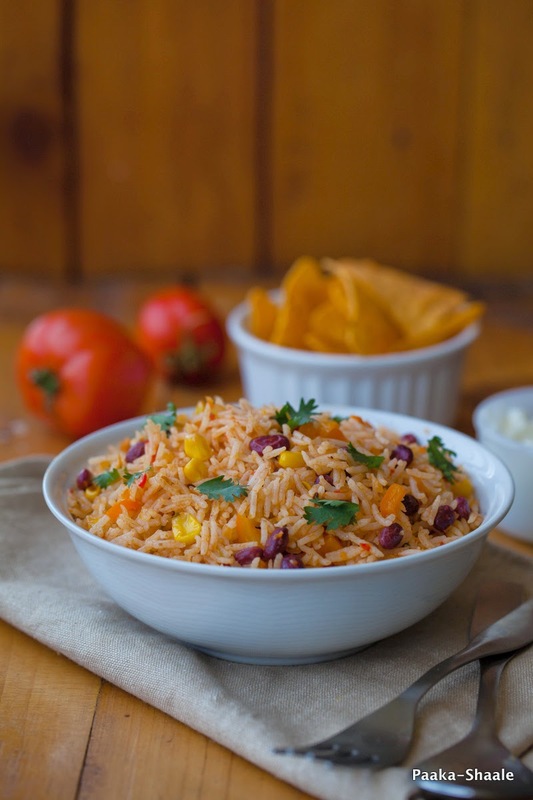 such a great meal option and when its Mexican you know there is a feast for your tastebuds.